Botox® is arguably the most popular injectable treatment for reducing the appearance of lines and wrinkles. 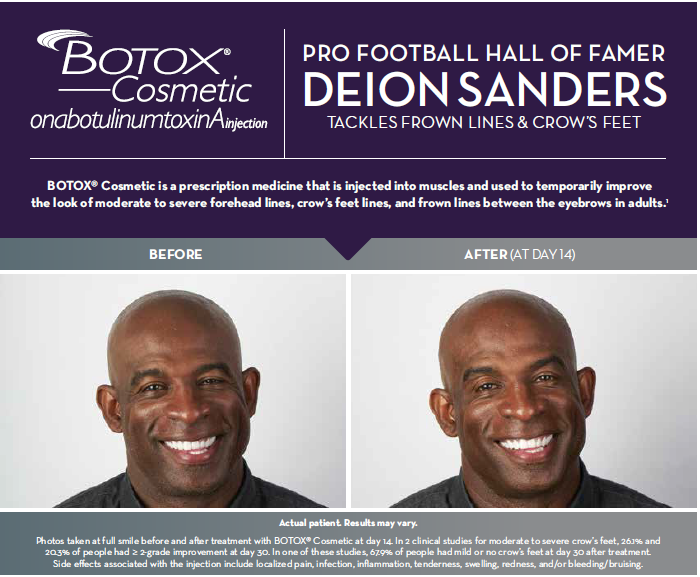 Botox® works by relaxing the muscles in the face. Jacksonville Plastic Surgery, led by Dr. Obi, offers Botox® and other injectable treatments to men and women living in St. Augustine, Jacksonville, and the surrounding areas of Florida. Many wrinkles in the face are caused by the repeated contraction of muscles that occurs when facial expressions are made. *This is most commonly seen in the forehead area, leading to horizontal lines and crows feet. Botox® is the most common treatment for these issues and works by relaxing the facial muscles to prevent further contractions and wrinkles. *Botox® can also be used to treat excessive sweating, migraines and bumps on the chin. *Individual results vary. The benefits of Botox, or neuromodulators, are cited according to the manufacturers’ package insert. During your Botox® treatment, a fine needle will be used to make a number of injections around the treatment area. *Botox® treatment usually takes less than 30 minutes. After your treatment, you are free to resume your normal daily routine, as there is no downtime required for Botox®. It can take up to a week for the results from treatment to take effect, which will then last up to four months. Many patients schedule regular Botox® appointments to maintain their youthful appearance year-round. How Much Does Botox® Cost in Jacksonville? The cost of your Botox® treatment will depend on the number of injections performed, which depends on your treatment goals. Our complimentary aesthetic consultation is the first step toward achieving your goals, during which we will review all possible treatment options and their costs. We do everything possible to make our treatments affordable for our patients, including offering several payment options and financing through CareCredit®, Prosper Healthcare Lending or GreenSky™. If you are considering Botox® or any other dermal filler or injectable treatment, contact us today to schedule a complimentary aesthetic consultation with Dr. Obi. Jacksonville Plastic Surgery welcomes patients living in St. Augustine, Ponte Vedra Beach, Jacksonville, and the surrounding areas of Florida.